With the fourth round of the Le Mans Series – Donington Park, August 26-27 – not too far away, here’s some significant entry news. #9 will be driven by Jamie Campbell-Walter, Beppe Gabbiani and Felipe Ortiz, and #10 by Nic Minassian and TBA – but the TBA is very close to being confirmed. So congratulations to Creation for getting its second hybrid built up and ready to race. “We’re hoping to shake the car down in the UK in the next couple of weeks,” adds Ian Bickerton. The team has a two day test planned at Jarama before the Donington Park event – all of which reveals how badly Creation wants to secure second spot in the LMP1 Class of the Le Mans Series. But the Creation news doesn’t stop there. “Donington Park will be the only time we’ll run the two cars together in Europe,” reveals Ian Bickerton. So at the end of a quiet week for news, Ian Bickerton and Mike Jankowski are creating most of it themselves. Donington Park looks like an event not to be missed by UK sportscar fans. Can Creation grab that first Le Mans Series win at home? They couldn’t have come closer in their home race (Silverstone) last year. 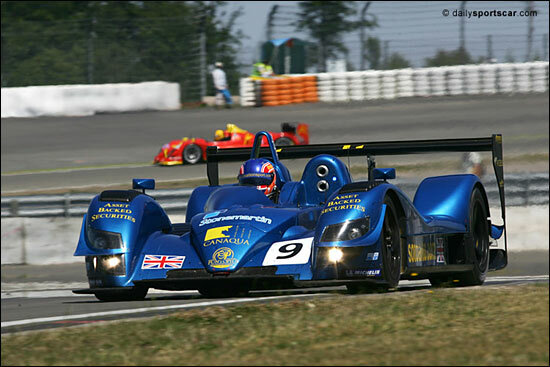 Here's Nic Minassian on the way to second place at the Nurburgring last month.